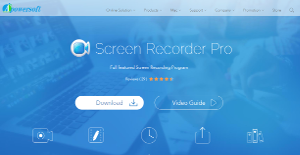 What is Screen Recorder Pro? Screen Recorder Pro is a user-friendly yet highly professional screen recording solution that caters to all user types. It enables you to record screen with high-quality audio and save the video in multiple formats, including AVI, MP4, MOV, MKV, WMV, VOB, and WEBM. All your saved videos are exported to your preferred formats with no loss in quality. With Screen Recorder Pro, you have a reliable, highly versatile tool to record all your desktop activities. It is a perfect solution for recording live feeds, video streaming, instructional materials, and more. You can also inject your webcam video into your screencast for that video-in-video effect. Screen Recorder Pro by Apowersoft offers you a variety of recording modes that suit your purpose. You can go Full-Screen mode to record all activities that happen on your computer screen or opt for Custom Area mode if you want to record only a specific area of the screen. If you want to implement a hands-on, instructional approach where you can emphasize what you are doing or you want to strongly point out something in your screen cast, the Around Mouse mode follows the mouse tracker and records the area surrounding it. Other modes are also available. Screen Recorder Pro not only lets you record the screen but it can also capture the audio from internal and external systems, such as microphones, music players, and more. You can also record screen view using your webcam as this software works well with Skype, MSN, and Google Talk among others, allowing you to emphasize your point or simply showcase what you got going from your end. Screen Recorder Pro comes with two editing tools that allow you to edit your screencast in real time or afterward. You can add annotations to effectively convey your message or point something out in the video, all in real time. Or you polish your video afterward with enhancing tools if you want. What Problems Will Screen Recorder Pro Solve? A. Record live streaming video: Anna works in a foreign company who needs to study English for improving herself. There are many kinds of English lessons on BBC, but it is a live streaming service so she can’t download them. Now Anna can use Screen Recorder Pro to record those lessons for learning during her spare time. B. Record webinar: David is a businessman who is always busy in attending various meetings. Sometimes he doesn’t have time to attend the meeting while on an airplane but it is very important to him. He can schedule to record any planned meeting on the web easily with the help of Screen Recorder Pro. C. Record instructions: Jason is a leader of an IT company and has to introduce many tips or rules of related project applications to his new colleagues. To improve efficiency, he recorded all of them with voice explanation so that any of his colleagues can learn conveniently. There are trendy and widely used solutions in each software group. But are they essentially the best fit for your enterprise’s unique wants? A trendy software application may have thousands of users, but does it present what you require? For this reason, do not blindly spend on popular systems. Read at least a few Screen Recorder Pro reviews and mull over the factors that you wish to have in the software such as the fees, main tools, available integrations etc. Then, select a few systems that fit your wants. Try out the free trials of these products, read online comments, get clarifications from the vendor, and do your homework meticulously. This in-depth groundwork is certain to aid you find the most excellent software application for your company’s special requirements. How Much Does Screen Recorder Pro Cost? Screen Recorder Pro’s enterprise pricing information is available only upon request. Contact the company for more details, and ask for your quote. We realize that when you make a decision to buy Communications Software it’s important not only to see how experts evaluate it in their reviews, but also to find out if the real people and companies that buy it are actually satisfied with the product. That’s why we’ve created our behavior-based Customer Satisfaction Algorithm™ that gathers customer reviews, comments and Screen Recorder Pro reviews across a wide range of social media sites. The data is then presented in an easy to digest form showing how many people had positive and negative experience with Screen Recorder Pro. With that information at hand you should be equipped to make an informed buying decision that you won’t regret. What are Screen Recorder Pro pricing details? What integrations are available for Screen Recorder Pro? If you need more information about Screen Recorder Pro or you simply have a question let us know what you need and we’ll forward your request directly to the vendor.